Thanks for taking time out to chat with us seeing as you just got back from Qatar yesterday, how tricky was it adapting to race at night? Not too bad at all to be honest, I went to bed late and woke up a little bit later than usual so it wasn’t too difficult to adapt to. It was more difficult going to America to race in Texas where I’d go to sleep and wake up at the usual times. It’s easy to delay sleep but you can’t delay the waking up side of it so it’s far easier to stay up late to adapt to things. How is your wrist coming along? Really good, thanks. I’d say it’s back to 99% of what it was before the injury, it’s really good. The operation was straight after the crash last year at the Philip Island round and I was racing five days later. The other wrist has a plate and five screws and that was fixed up by an Aussie surgeon but the recent injury didn’t need any metalwork. Neither wrists are giving me any trouble at all. What would you say was the biggest surprise when jumping on a MotoGP bike for the first time this season? The extra power wasn’t too hard to get used to. The brakes have given me a real headache. I’m using carbon discs with Nissin calipers so it’s different. I also didn’t realise the bike setup made such a huge difference with these carbon brakes. It was different in Moto2, so it’s been harder getting my head around the setup to get the brakes working. The biggest surprise for me in moving to MotoGP is having so many things that you can change, the electronics, the suspension, the brakes, the setup. You can change the engine braking for each corner, each gear. There’s no need to use the clutch to back-shift, the bike does it for you, it blips automatically I don’t even touch the clutch. 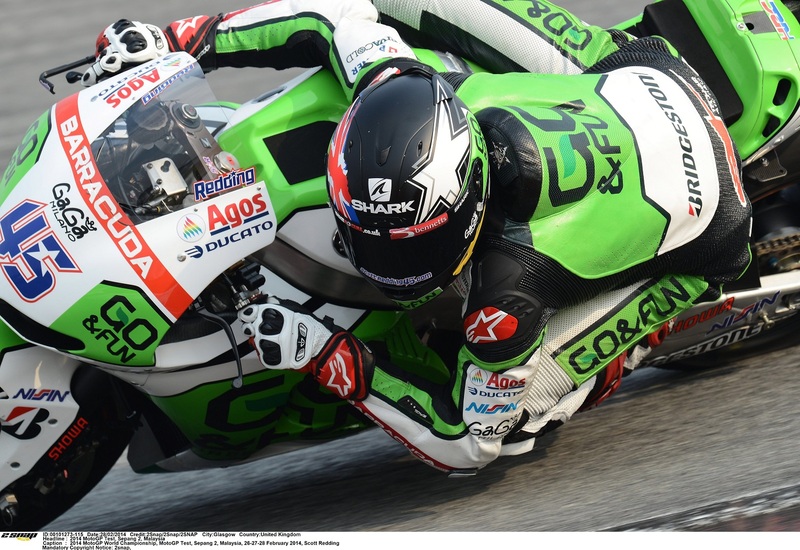 Is it harder at the sharp end in MotoGP compared to Moto2? It’s too early to say as I haven’t been right up at the front yet, but between me and Nicky (Hayden) he started really fast and then things balanced out a little. The tyres in MotoGP drop off and then come back again almost, which is quite strange. With regards to riding style I’m consciously trying to get the bike picked up and onto the traction area of the tyre. It sounds strange but when braking you need to be braking at an angle, if the bike is straight you can’t really stop, it needs to be at an angle. There are a few things I need to change along with getting more and more lean angle as well as choosing the right time to pick the bike up. Nicky and I are on exactly the same package this year although I’m using Nissin brakes and Showa suspension and Nicky is using Brembo brakes with Ohlins suspension. Are you guys sharing any data at all? There’s no data being shared. We give data to Honda but they don’t pass it between the riders. Have you made any changes to your training regime to deal with riding a MotoGP bike? I haven’t tried to put on any extra muscle, I’m trying to stay lean. I’m not exactly panicking about my weight but at the same time I’m not going to put any weight on. I’m getting training with One Vision Performance and I’m doing a lot of Cross Fit stuff as well as having my diet done by those guys. It was 50 jump squats followed by 60 jump lunges followed by another 60 of something else and I thought “I can’t do this anymore” but after finishing it I felt a lot better. It paid off because during the first round at Qatar this week I felt 100% all the way through. Even with all that power, weight does still make a difference and I’m doing my best to keep it down. I’m at 78kg now (12.2 stone) and the average rider in MotoGP is around 65kg. I know Dani Pedrosa is less than 60kg. I think if they introduced a combined rider/bike weight limit it would make things more even, it’s only fair. It’s genetics at the end of the day and it’s not my choice to be this size. If I was huge and muscular then that would be different, if I had a choice I’d be shorter. It just plays with your mind, forget it. So now I don’t bother although my left glove needs to go on first due to the scarring on the wrist. That glove goes on first and then I do a stretch before every session, it isn’t superstitious it’s just tucking in to stretch the muscles before I get on the bike. I definitely used to be that way and I got my head around it. It used to be certain under-shorts with certain socks and I’d have to get on the bike in a certain way. Last year I convinced myself to stop doing that stuff by telling myself to stick the right boot on first. What encourages it is if you change something and you end up going slower it plays with your mind. I didn’t do that, I should have done this, and so on. The year before last I had a habit of looking at the time and my routine was so set in stone that I’d be from my motorhome to my pit garage in exactly six minutes, within five seconds, every single time including a scooter journey. Having done so well at Qatar in round one, have your plans changed for the rest of this season? I’m going to take every round as it comes. My target is to beat Nicky. I need to work on my single lap times because Nicky is very strong in that area and I think I can learn from him there. With a new tyre and a single lap for example qualifying, he can drop half a second on me and I’m wondering how I’m supposed to catch up with that. In the race I need to continue with what I’m doing and if Honda can give us some more power as well as us being able to use the hard tyre we can be more consistent in the race. My starts are a bit sh*t in practice but I’ve told the team that when it comes to the race they don’t need to worry because my starts are always good when it counts. 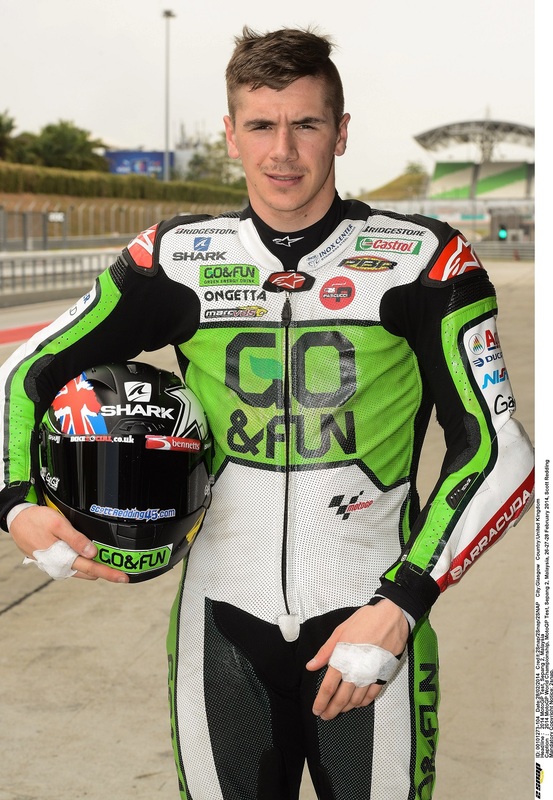 Redding was speaking at Silverstone for an event arranged by insurance specialists Bennetts where they announced support for rising stars in the racing scene for 2014.